No…contrary to popular belief, Indian golf is 2018 was not all about Shubhankar Sharma. Of course, the 22-year-old from Chandigarh was the cynosure of all eyes from the moment he started the year. The win at Joburg in December 2017 had raised expectations, and Sharma did not keep his fans waiting for long to deliver. He backed it up in February by winning the Maybank Championship and then dazzled the world by leading the WGC-Mexico Championship after three rounds. In the end, Sharma closed an unforgettable season with European Tour Rookie of the Year honour and became the Asian Tour No 1 by winning the Order of Merit. But there were several other newsmakers this year, including Khalin Joshi and Viraj Madappa, who recorded their breakthrough wins, and the resurgence of talented players like Rahil Gangjee and S Chikkarangappa. On the two elite Tours, Anirban Lahiri and Aditi Ashok comfortably kept their cards with occasional flashes of brilliance on the PGA Tour and the LPGA respectively. A big feelgood moment came late in the year when seven Indian ladies qualified for the Ladies European Tour and five of them managed to earn some status for 2019. Neha Tripathi, who did not go to the LET Q School, had earlier shown what she is capable of by shooting a 10-under par 62 final round to win the WGAI event at the Classic Golf & Country Club. On the amateur front, Rayhan Thomas continued to impress. The way he fought back after a disappointing opening round at the Asia-Pacific Amateur Championship in Singapore to finish tied second was just another appetizer to what is going to be an awesome full course meal when he eventually turns professional. So, here are some of the highlights of Indian golf in 2018. In the words of Shiv Kapur, it was the finest final round of the year – and even better than Alex Noren’s Sunday 62 to win the 2017 BMW PGA Championship. The conditions at Saujana were brutal and Sharma started the day four behind leader Jorge Campillo. Birdies on 17 and 18 gave him a two-shot win – his second in four European Tour starts. The round was the best of the day by four shots. The final round of WGC-Mexico Championship did not go as per plans, but after leading the elite tournament for the first three days, Sharma had done enough to catch the attention of the golfing world – including the decision-makers at Augusta National Golf Club. At the end of a tiring flight back to India to participate in the Hero Indian Open, good news awaited Sharma on landing. He became only the second Indian to receive an invitation to play the Masters, which became the first major championship of his career. In the absence of Aditi Ashok, some fans questioned the scoring ability of the ladies playing in the Women’s Golf Association of India (WGAI) Tour. Neha Tripathi put all that to rest with a stunning round of 10-under par 62 to win the Classic Golf & Country Club leg of the Hero Women’s Pro Golf Tour in March. Not only was it the lowest round on the Tour, but her eventual 14-shot win also happens to be the largest margin of victory ever. The domestic professional tour in India received a massive boost during the Open Championship in Carnoustie in July when a two-year-long process culminated in the PGTI Tour successfully getting world ranking points for its events. After getting the nod from the Official World Golf Ranking board, tournaments on the PGTI Tour will offer five points to the champions starting 2019, three to the runner-up with the top five players getting a share of points. Ever since Viraj Madappa turned pro, he had been earmarked as the next big Indian talent to look forward to. But the Bengaluru boy, who started his golf in Kolkata, was more like a frustrated spectactor in the opening part of the season given the limited opportunities to play on the big stage after coming through the Asian Tour Q School. That all changed at the KGA course during the Take Solutions Masters where he was solid all the way through his four rounds to register his maiden victory on the Asian Tour by two shots. Khalin Joshi came close to tasting victory on the international scene on various occasions, including the Maybank Championship which was won by his dearest friend Sharma earlier in the year. The Bengaluru lad finally delivered at the Panasonic Open India in the last week of October. A Tiger Woods-like fist pump on the 18th hole was a fair indication of his emotions. The Sunday at the Delhi Golf Club wasn’t going too well, but Joshi dipped into his reserves and produced a stunning finish of four birdies in last five holes to win by one shot. There were enough signs of Gaganjeet Bhullar threatening to win a fourth title in the last three years. He was inside the top-11 in his last four starts when he reached the Natadola course for the Fiji International in the first week of August. The Indian ace chose the perfect stage for his record ninth win on the Asian Tour. A chipped in eagle on the 17th hole on Sunday was the highlight as he won by two and also secured his card on the European Tour, which was one of the co-sanctioning bodies of the tournament. 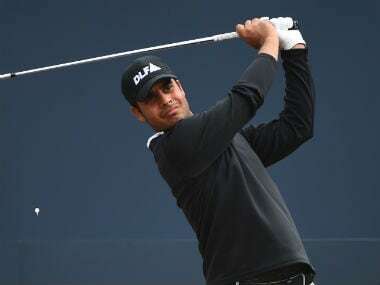 Rahil Gangjee’s wait of 14 years and two weeks for his first international title since winning the Volkswagen Masters China in 2004 finally ended in April this year when he won the Panasonic Open Golf Championship in Japan. Gangjee, easily one of the most popular members of the Asian Tour, once admitted he was almost ‘bankrupt’ after two failed seasons on the Web.com Tour. He now has the luxury of plying his trade on the Asian as well as Japan Golf Tour after his thrilling one-shot win. It was an honour befitting the legend that Jeev Milkha Singh is for Indian golf. In October, the Chandigarh ace became the first player to have a tournament named after him in his home club Chandigarh Golf Club, thanks to the proactiveness of sponsors Take Solutions and PGTI. By all accounts, the inaugural Jeev Milkha Singh Invitational was a massive success. Nine-under par through 16 holes in the second round of the Greenbrier Classic, Lahiri failed to make a birdie on the par-5 17th and the par-3 18th for what could have been the first ever 59 by an Indian. But the resulting 61 definitely gave him one of his finest memories on the PGA Tour in 2018, where he finally finished the season 99th on the FedEx Cup standings. At the end of April and in the first week of May, Aditi Ashok recorded back-to-back top-10 finishes on LPGA Tour. She was tied seventh at the LPGA Mediheal Championship – her best result on the Tour in two years – and then bettered it with a tied sixth place at the Volunteers of America LPGA Texas Classic. She finished 2018 69th in the CME Ranking. A lot has changed for Chikkarangappa. To begin with, he ended his relationship with Vijay Divecha (whom he still considers his ‘life coach’) and started working with the Pune-based Laurence Brotheridge. Within weeks, he won the Jeev Milkha Singh Invitational on the PGTI Tour, and then spectacularly secured his Asian Tour card with a runners-up finish at the Mauritius Open. When Rayhan Thomas opened with a 74 in the Asia-Pacific Amateur Championship, considered one of the five majors in amateur golf, he was staring at a missed cut. 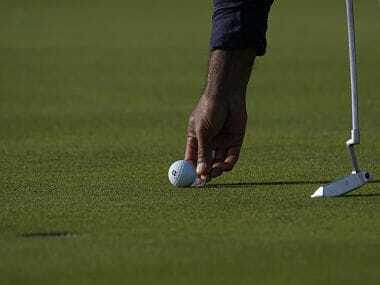 But the 19-year-old Dubai-based Indian reversed his fortunes in spectacular fashion with rounds of 64, 65 and 66 to finish tied second – an Indian record. Earlier, he had shot a sublime nine-under par round on the opening day of the Eisenhower Trophy in Dublin. His only regret – he just did not play well enough to get India a medal at the Asian Games. In the third week of December, seven Indian ladies – Astha Madan, Diksha Dagar, Tvesa Malik, Vani Kapoor, Sharmila Nicollet, Saaniya Sharma and Ridhima Dilawari – made it to the final stage of the Ladies European Tour Qualifying School. The local WGAI Tour has come a long way from the time when it struggled to get even one member on the Tour not too long ago. Well, when you have as sensational a season as Sharma, a few year-end gongs are bound to come your way. In this instance, it was the first-ever Rookie of the Year award for an Indian on the European Tour, and then the Asian Tour Order of Merit crown for the young man. Just about the perfect way to finish an amazing year.